Zion Market Research has published a new report titled “Carbon Fiber Market (Polyacrylonitrile (PAN) based, Pitch-based, and Others) for Aerospace and Defense, Wind Energy, Construction Automotive, Sports, and Other End-user: Global Industry Perspective, Comprehensive Analysis, Size, Share, Growth, Segment, Trends and Forecast, 2015 – 2021”. 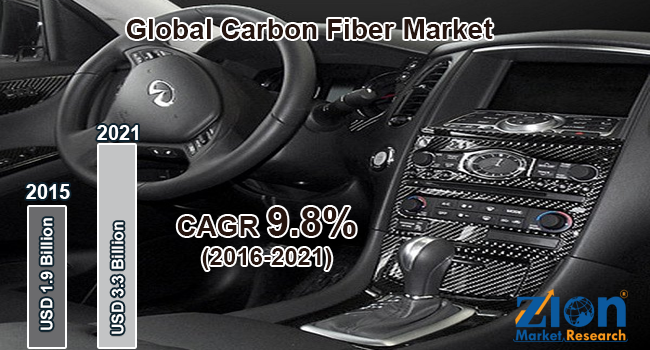 The global carbon fiber market volume accounted for around 35-kilo tons while market revenue accounted for approximately USD 1.9 Billion in 2015 and is expected to reach approximately USD 3.3 Billion by 2021, growing at a CAGR of around 9.8% between 2016 and 2021. Carbon fiber composites are usually preferred in applications where strength, low weight, stiffness and outstanding fatigue characteristics are necessary requirements. Several thousand carbon fibers are bundled together to form a tow, which may be used by itself or woven into a fabric. Carbon fiber composites are relatively new and refined material that has found many uses in the field of automobiles, aviation, sports, construction and even medical devices. Various types of carbon fibers are manufactured across the globe. These include polyacrylonitrile (PAN) based, rayon-based, pitch-based and others. Pitch-based and PAN-based carbon fibers are the major product segments of the global carbon fiber market. Polyacrylonitrile (PAN) based product type accounted for the major share of carbon fiber market globally. PAN based carbon fiber is followed by pitch-based carbon fiber. While others segment which includes rayon based, polyolefin-based carbon fiber is expected to be fastest growing segment during the forecast period. Wind energy was the largest end-user segment. While automotive is expected to be the fastest growing end-user segment followed by sporting goods during the forecast period. In terms of geography, North America was the largest consumer of carbon fiber in 2015. The consumption in North America is mainly driven by usage of carbon fiber in the U.S. Currently; the U.S. uses almost half of the world production of carbon fibers. The Asia-Pacific market is expected to grow at a swift pace mainly due to rising demand for carbon fiber and their composites from emerging countries in Asia such as India, Japan, and China. Europe is second largest consumer of carbon fiber globally. Increasing demand from end-user industries such as aerospace and defense, wind energy, and automotive is expected to drive the carbon fiber market in Europe in the future. While, Latin America, and the Middle East and Africa are expected to register noticeable growth during the forecast period. Some of the key players of the market include Toray Industries, Cytec Industries, Mitsubishi Rayon Co., Ltd., SGL Group – The Carbon Company, Hexcel Corporation, Kemrock Industries and Exports Ltd., Formosa Plastics Corporation, DowAksa, Teijin Ltd, Zoltek Companies, Inc., Kureha Corporation and others.